You’ll find all the information you need right here, to help you sort your organic materials effectively. You will quickly realize that with very little effort and a bit of adapting, it’s really quite simple! So, in short, what does a brown bin eat? 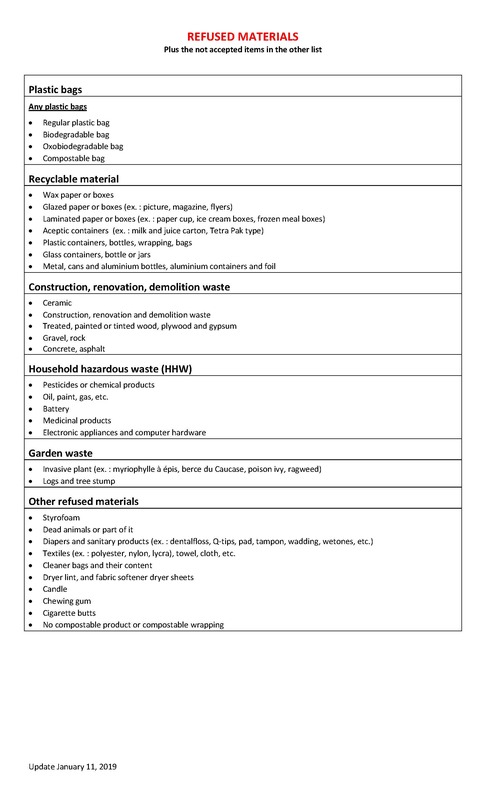 In this section you’ll find a list of accepted and refused materials for your brown bin. The materials are accepted in bulk, wrapped inside newspapers (or flyers) or placed in paper bags. The grasscycling is the solution for your lawn. The brown bin will take all types of food, raw or cooked, fresh or tainted, including fruits and vegetables, meat, sauces, dairy products, fish and seafood. 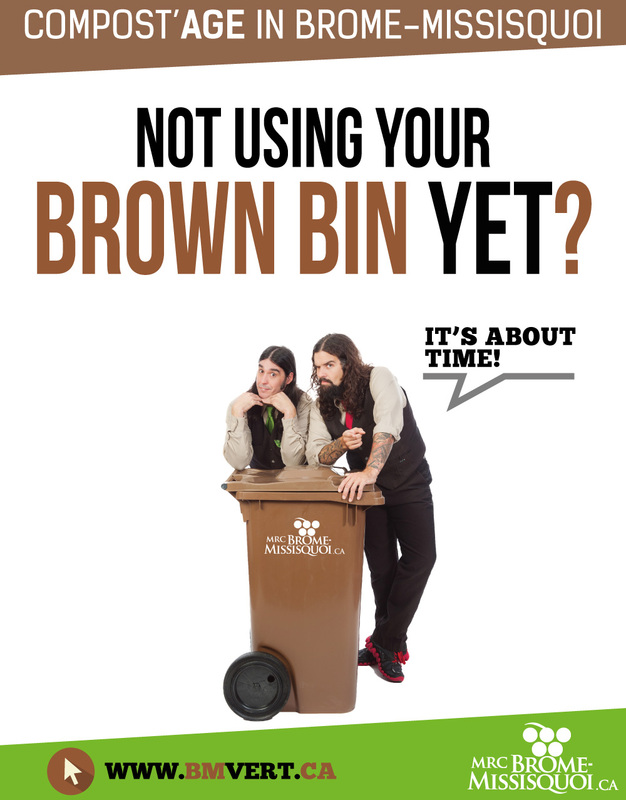 Your brown bin will also accept paper and cardboard, soiled or not, as well as tissues and paper towels that haven’t been in contact with chemical products (cleaning products, motor oil, paint, etc.). 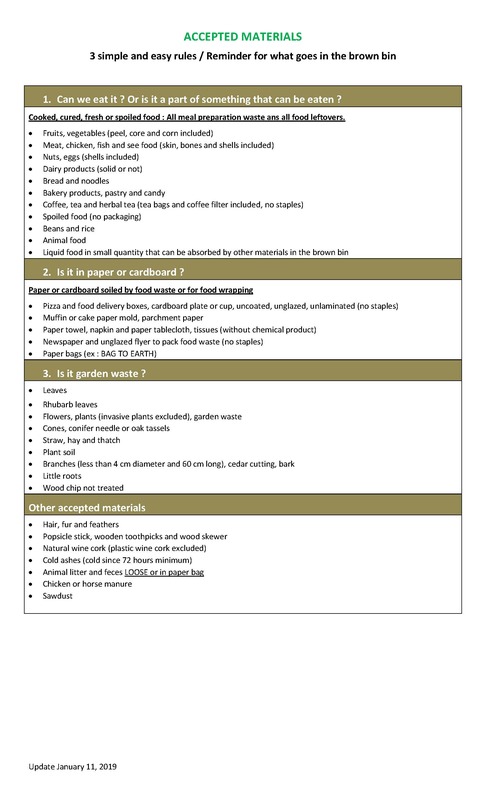 Moreover, a portion of your dead leaves can be sent to the composting centre via the brown bin collected by your municipality. LITTER AND ANIMAL FECES: In bulk or in paper bags only! No “poop” bags! (these bags, even if they’re biodegradable, won’t be accepted at the composting centre). PLASTIC OR BIODEGRADABLE BAGS AND COMPOSTABLE DISHES: No plastic-type bags, compostable or biodegradable, will be accepted in the brown bin because they require more decomposing time than the regular composting process and therefore will contaminate the end product. This applies to compostable dishware as well. As for oxo degradable products, they are actually made with plastic microparticles, so only the binding agent will degrade in the light. GLASS: It seems quite obvious to everyone that glass doesn’t ever go into the brown bin, in no matter what form. It is in fact one of the most problematic contaminants in composting centres because it’s impossible to remove all the little fragments from mature compost. CIGARETTE BUTTS: cigarette filters are not biodegradable and therefore cannot go into the brown bin… Anyway, how would like to see all these chemical products in your tomatoes?